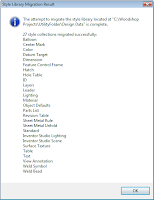 Application Options, or Project Folder Options, which is right for me? A Inventor Geek’s thoughts. 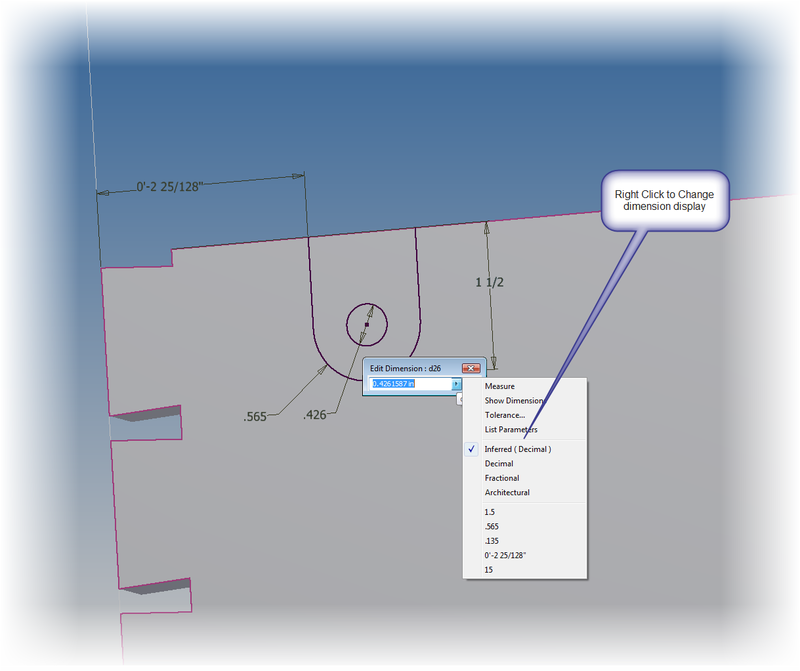 Recently, someone asked me my thoughts on how I set up paths in for my design data, templates, and content center files in Inventor, so I thought I'd dedicate this blog to discuss these paths, and why I set mine up the way I do. Design Data – This directory is where your external design library data is, such as materials, dimension styles, text styles, etc. are kept. 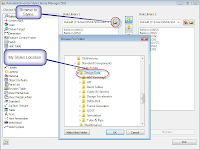 Templates – This directory defines where your template file location is. 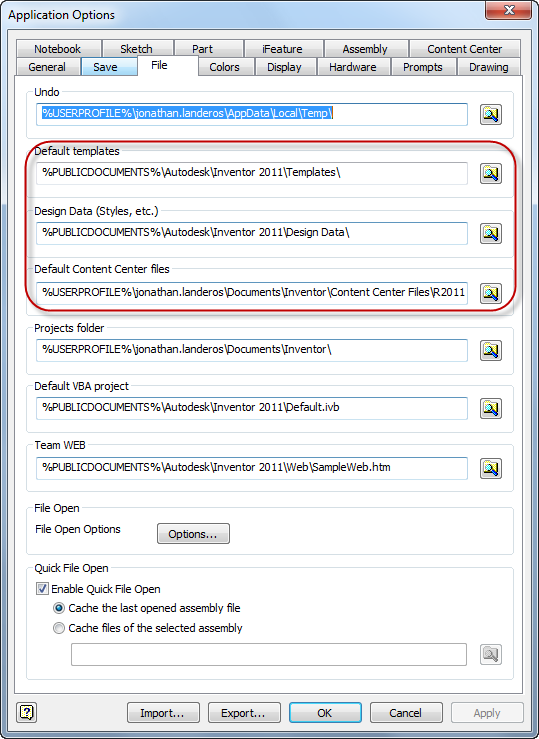 Content Center – This is where Content Center components are created when you place a file from Content Center. 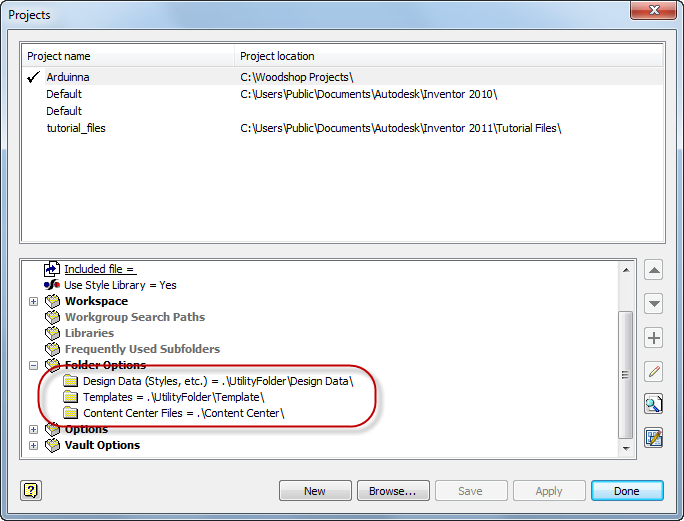 If you don't change anything, these paths are defined inside of your Application Options, on the 'File' tab. You can change these paths to another location; for example, move them to a network drive. This can be advantageous, even necessary, in a shared environment. If you do it this way, there's absolutely nothing wrong with it. The method works just fine. 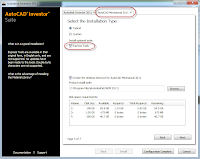 But when you move to a new version of Inventor, you will have to makes sure you update these locations in the new installation. For this reason alone, I like a different approach. I define my paths in my project file. 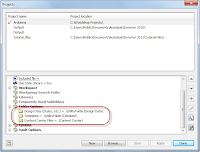 When defined in the project file, they override any settings from Application Options, causing the project file to now define the paths for this project only. Where I set my folder options. In the project. 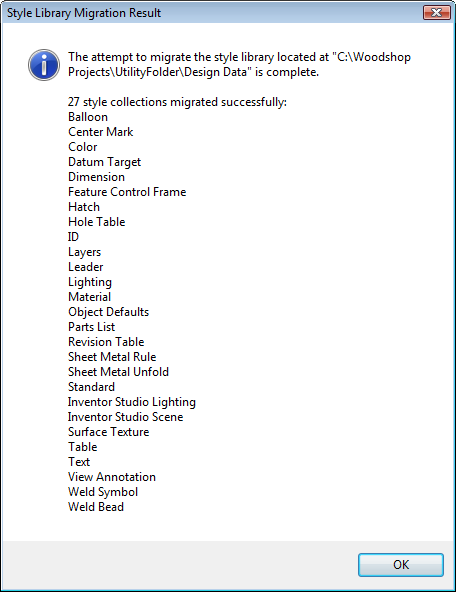 Incidentally, other projects can still use Application Options by leaving these paths set to default, or they can have totally different sets of folders if you'd like. So, what's the big deal? Why do it that way? 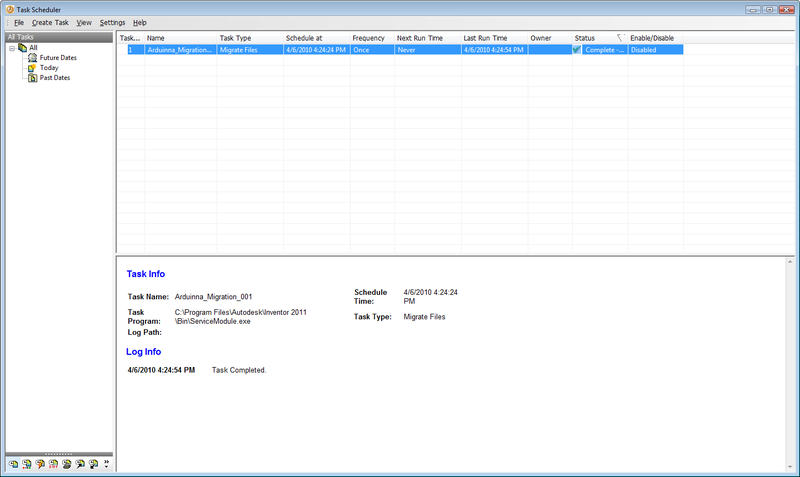 I do it for one big reason; when I migrate from release to release, I open up and save my project. Now my paths for design data, templates, and content center are all updated to my preferred settings. I don't have to go to Application Options, locate all the paths, and reset them. I really like this for shared environments, especially when Vault is being used. When you have five systems to upgrade, avoiding having to open Application Options and change three paths per machine has a real appeal to me! So, wrapping up, should everyone use it? I leave that for the individual users to decide. True, if you ask me my opinion, it's my preferred method and I've used this for about three releases for my personal Inventor project, Arduinna. But if anything, perhaps this is food for thought. In order to exercise your options, you have to know what your options are! My Viewer Won't View! Design review 2011 with Vault 2010. Having been that a fool more than five minutes on a given day, I know the feeling of having the unexpected happen. 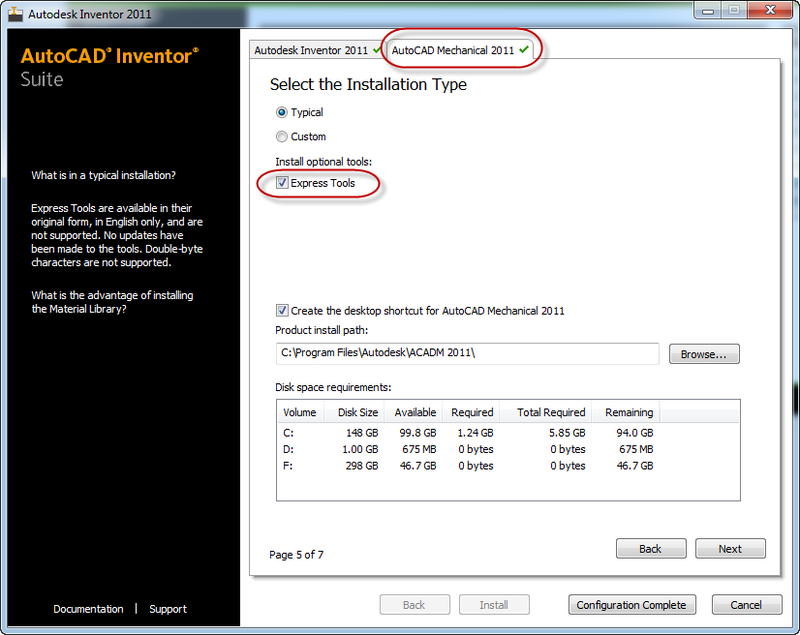 One of those is getting Autodesk Design Review 2011 (often abbreviated 'ADR') to run inside Vault 2010. If you're running and older version of Autodesk Design Review, you'll probably get a notice that an upgrade is available. And which one of us, when presented with that shiny 'Update Now' button, hasn't been beguiled by its allure? I know I'm guilty of saying 'Update! Of course I want to update! Wait, what did I just update?" If you're running Vault 2010, and you upgrade to Autodesk Design Review to 2011, you'll get an error in your Vault Explorer preview window that your viewer isn't installed. 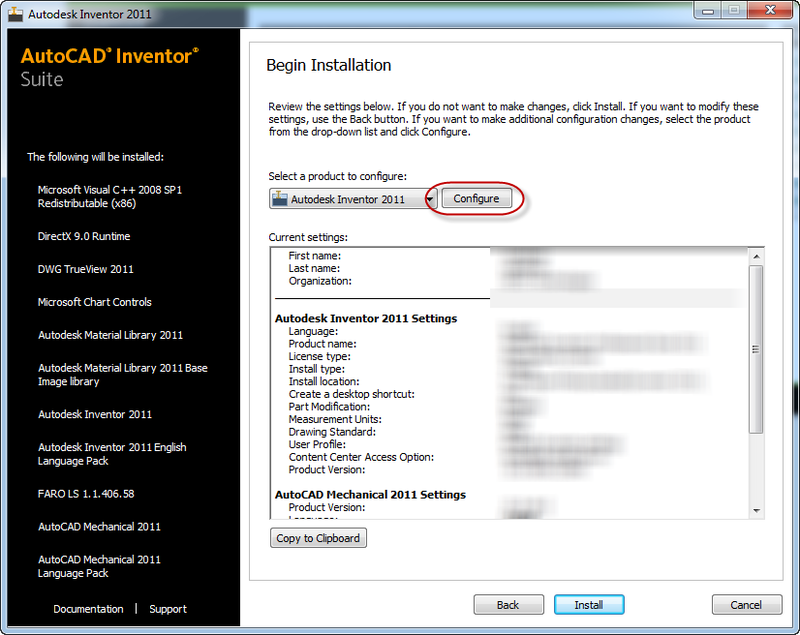 But wait, Autodesk Design Review 2011 is installed, right? Shouldn't that work? Ive updated to the latest version, right! The answer is yes, but Vault 2010 needs a little help to recognize this. 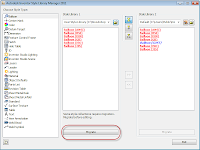 The answer comes in a small hotfix on the Autodesk website located at the link HERE. 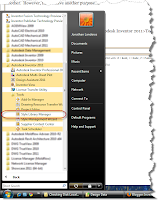 This hotfix allows Autodesk Design Review 2011 to work with Autodesk Vault 2010. After a few minutes, everything should be running smoothly. There we are, Vault as it should be! This weekend I upgraded my system to Windows 7, and I must say that it was one of the easiest OS upgrades I've ever done. I have my system up, all my important programs installed, and everything working. 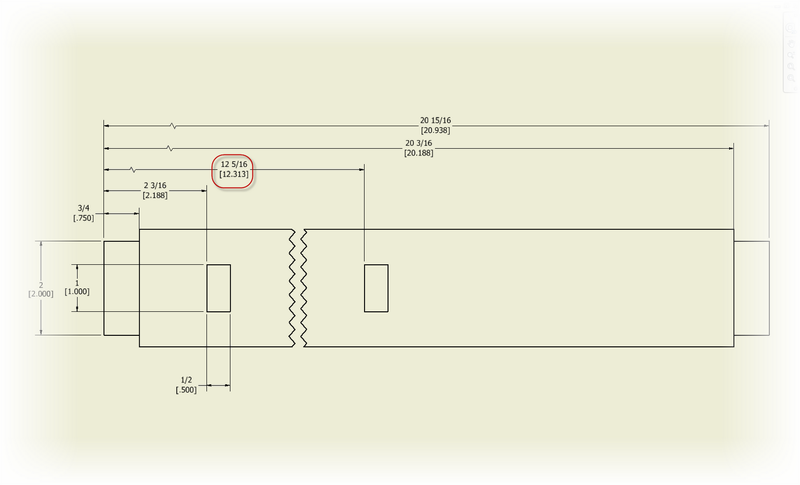 But during that install I remembered something in AutoCAD Mechanical that I've encountered before. That's right, today, I'm posting on AutoCAD Mechanical, although this applies to all AutoCAD based installs. It's the accidental omission of Express Tools from the installation. When installing any program, you should at least browse any additional options screens you see. Even if you don't change anything, I think it pays to double check. 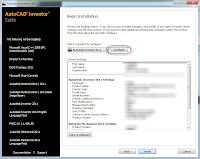 When installing an Autodesk program, check the configure screens. You'll rarely regret it. 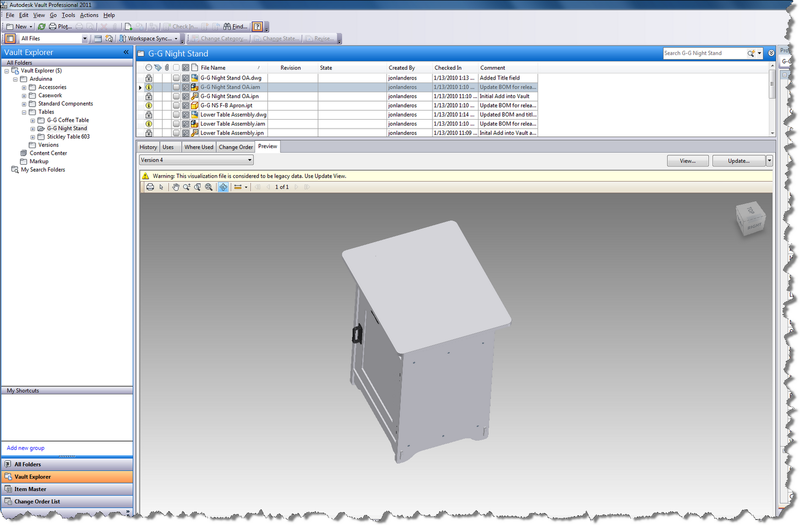 With Autodesk programs, this can be particular important for things like network licensing. 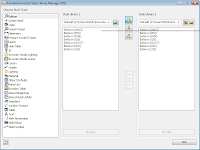 Autodesk software defaults to single seat (node locked) licensing unless you tell it otherwise. Granted, you can add them later using 'Add/Remove Features', but that requires extra steps, not to mention you'll have to get the disks. 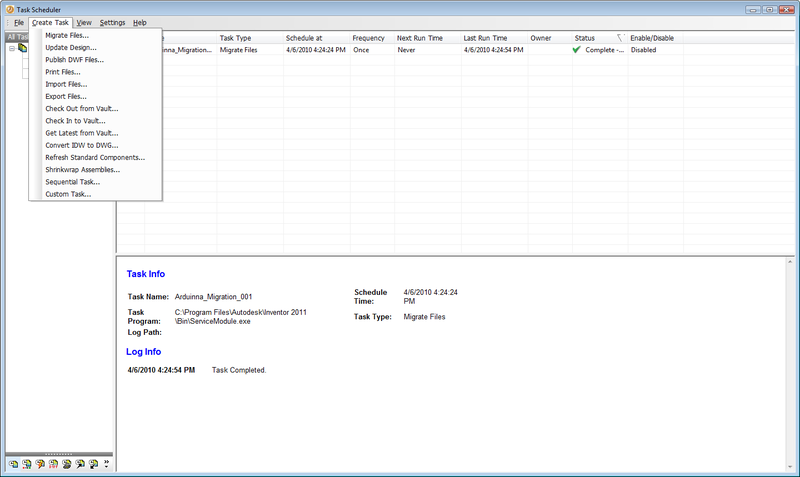 Which may mean scheduling with I.T. And for you I.T. guys, checking this little box may save you the hassle of having your CAD department outside your office door with torches and pitchforks because their Express tools are missing! Incidentally, one of the screens behind that 'Configure' button also changes the install from a Stand-alone to a Network license. So if your installing under a network license, make sure you hit that button. It can save you from some unpleasant reconfigurations after the fact. It's that time of the year again. Yes, I'm upgrading to the Autodesk 2011 based products, but I've also decided it's time to upgrade to Windows 7 as well. I've already started my basic steps, I've backed up my data, lined up the programs I have to install. I've spent hours just getting ready to install everything. In the middle of this, I was posed the following question. Shouldn't you always install hotfixes and service packs? In my opinion the answer varies. I'm not going to jump on a rock and proclaim that I have the 'one solution'. I've just always believed that the world exists in too many shades of gray for a 'one size fits all' approach to service packs. But what I will do is tell you what I do, why I do it, and give you an opinion that might help you form your own opinion. I see two major camps with respect to hotfixs and service packs. The upside for Camp 1 is they're always current. They fix every bug, glitch, hiccup and security hole as soon as possible. But Camp 1 isn't all hugs and puppies. The dark side of this approach is the possibility that fix may break something else. It's not likely, but it's been known to happen. For example, a few years ago there was the KB918118 incident. Where a Microsoft update broke Inventor so you couldn't see the text typed in the drawing. Camp 1 found themselves uninstalling the hotfix until a second hotfix was issued by Autodesk to repair the issue. That's right, Autodesk issued a hotfix to repair Microsoft's hotfix. It only happened once in my memory, but it was a busy week in tech support as we fought that issue! The other camp, Camp 2, never noticed this. Camp 2 is the 'if it ain't broke, I'm not gonna fix it' camp. They have their automatic updates turned off, and only install an update after checking the readme, and confirming that it fixes an issue they've encountered. But this camp may find that if they're not updating Windows, there can be some serious security holes. If they're not updating their applications, then they may not be aware that an issue they've been struggling with was repaired by Service Pack 'X' issued three months ago. These camps, of course, a bit extreme. I don't know how many of us truly fall in completely in to one or the other. But in Jon's world, I tend to live 'on the outskirts' of Camp 1. As far as Windows updates go, I always install them. Windows updates contain a lot of security fixes, and I don't want to be the one caught with a hole in my virtual fence. I may hit the occasional incident (like the KB918118), but for me, the risks of someone infiltrating my system through a security hole is a far scarier prospect. I'm a bit more liberal with my applications. I do install my updates, but I don't do it with as big of a sense of urgency. The service packs for applications tend to be bug fixes instead of security patches. So while I do ultimately install them, I'll see if there's an issue I've been having that's been fixed by the service pack. Many times, I'll wait until a Friday when I have a weekend to test things out a bit and make sure that the service pack doesn't break anything. Although aside from that KB918118 affair, I don't recall a time that I've seen that happen. And yes, sometimes it slips my mind and I install it weeks later when I remember. Which camp you exist in, is entirely up to you. I'm sure there's dozens of reasons for a given approach. So go ahead and comment on what you're thoughts are! I'm curious to see which camp you call home! When I speak of styles inside of Inventor, I talk about things like materials we assign to our parts, the dimensions styles we create our documentation with, the holes we cut into our components, among many other things controlled by styles. It's possible, even likely, you've spent much time customizing your styles to fit a certain need. That might be adding new holes to the thread table, adding materials you use to the library, or creating that special dimensions style that describes your tolerances perfectly. For example, for my woodshop projects, I created a dimension style that contains a dual dimension style with both decimal and fractional values. Of course we could create them over again, and that might be easy for small changes, but if we've put a lot of work into them, then that becomes incredibly time consuming. Fortunately, we have another way. 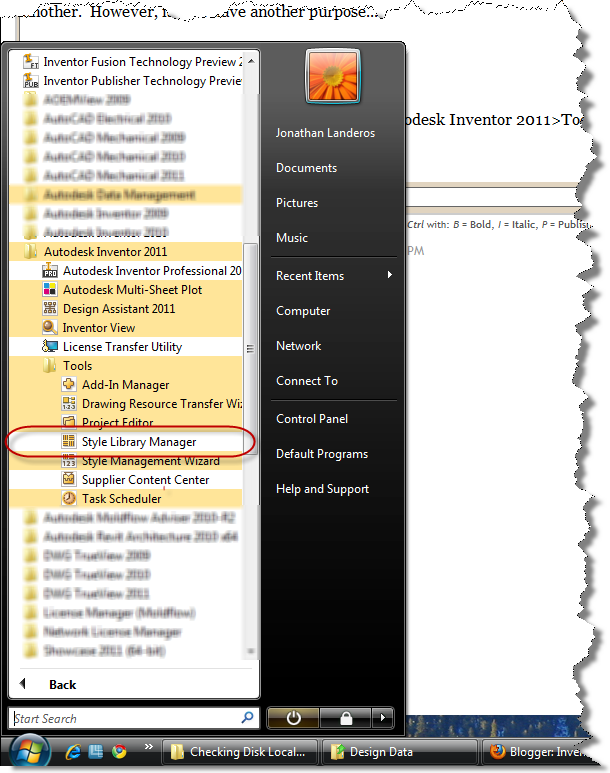 We have Inventor's Style Library Manager. So, how do we get to it? 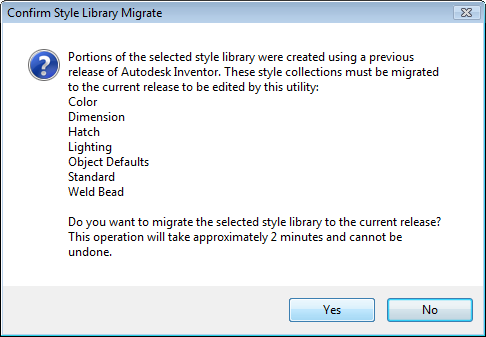 In Windows, go to Start>All Programs>Autodesk>Autodesk Inventor 2011>Tools>Style Library Manager. 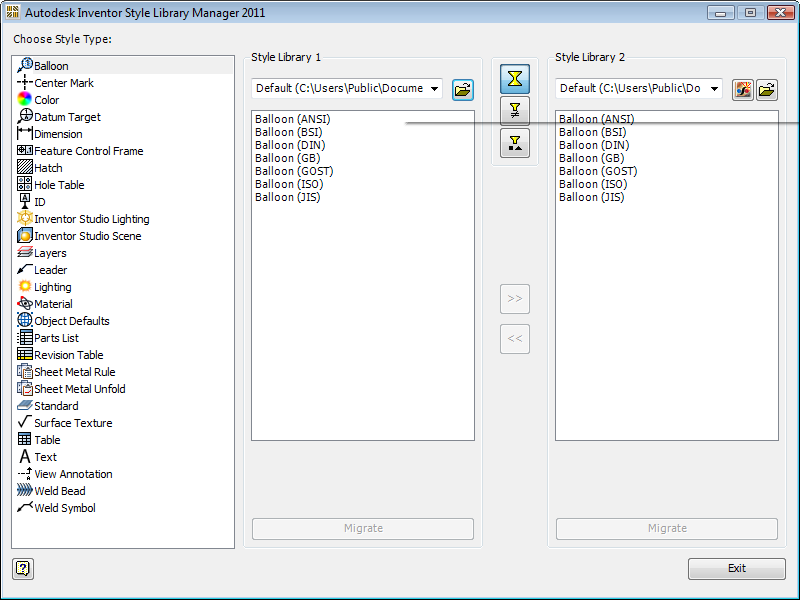 We see two columns, that's used to copy styles from one project file to another. Today, we're migrating styles, so we only need one column. I'll use the left column. Step 1, is to browse to the styles library I'm interested in. 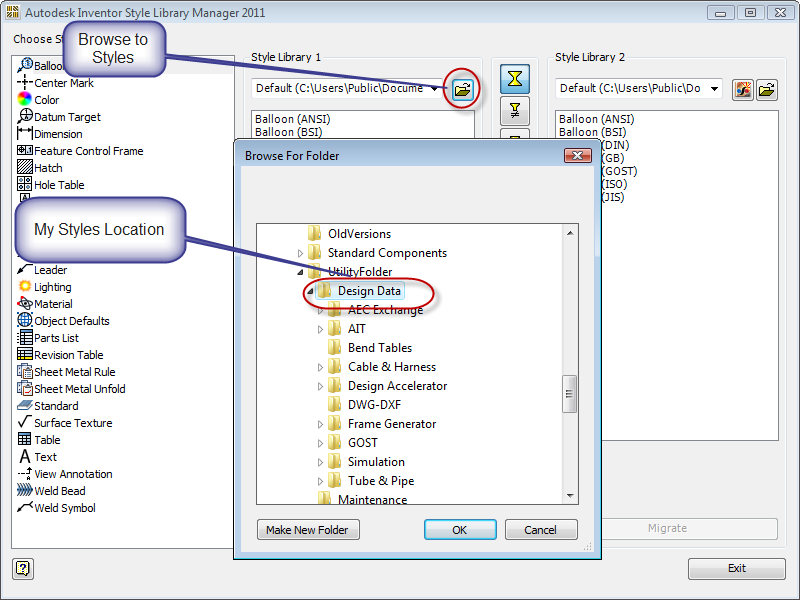 This is the location where your style libraries are located. 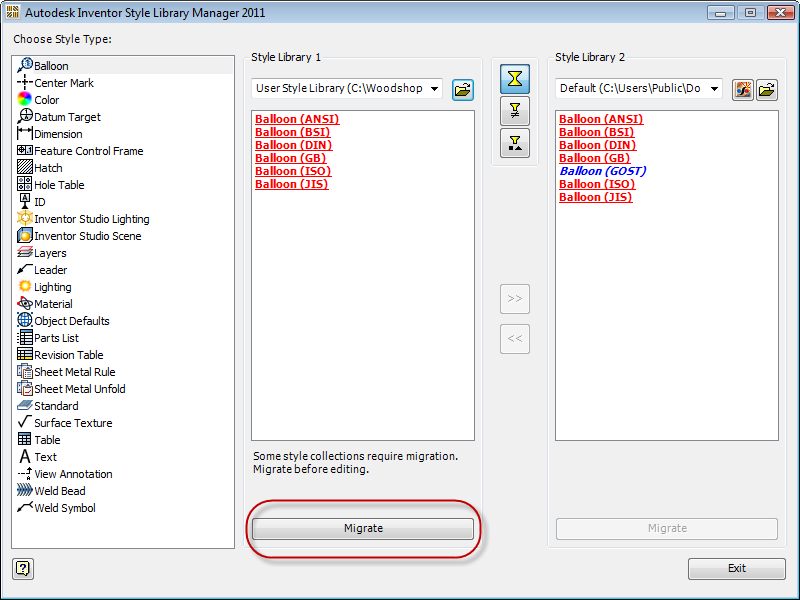 Once you have the Styles Library selected, the Migrate button will light up. Hit that button, and the migration will go! That's it. You're libraries are migrated, and ready to go!